Microarray analysis identifies keratin loci as sensitive biomarkers for thyroid hormone disruption in the salamander Ambystoma mexicanum. Title Microarray analysis identifies keratin loci as sensitive biomarkers for thyroid hormone disruption in the salamander Ambystoma mexicanum. 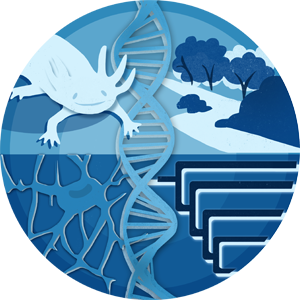 Ambystomatid salamanders offer several advantages for endocrine disruption research, including genomic and bioinformatics resources, an accessible laboratory model (Ambystoma mexicanum), and natural lineages that are broadly distributed among North American habitats. We used microarray analysis to measure the relative abundance of transcripts isolated from A. mexicanum epidermis (skin) after exogenous application of thyroid hormone (TH). Only one gene had a >2-fold change in transcript abundance after 2 days of TH treatment. However, hundreds of genes showed significantly different transcript levels at days 12 and 28 in comparison to day 0. A list of 123 TH-responsive genes was identified using statistical, BLAST, and fold level criteria. Cluster analysis identified two groups of genes with similar transcription patterns: up-regulated versus down-regulated. Most notably, several keratins exhibited dramatic (1000 fold) increases or decreases in transcript abundance. Keratin gene expression changes coincided with morphological remodeling of epithelial tissues. This suggests that keratin loci can be developed as sensitive biomarkers to assay temporal disruptions of larval-to-adult gene expression programs. Our study has identified the first collection of loci that are regulated during TH-induced metamorphosis in a salamander, thus setting the stage for future investigations of TH disruption in the Mexican axolotl and other salamanders of the genus Ambystoma.